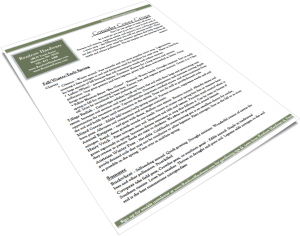 Prevent soil erosion, suppress weeds, and improve your soil by growing a cover crop – the following year you will see amazing results. 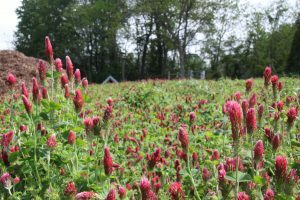 There are also a few great cover crops for summer gardens that help suppress weeds and attract pollinators. This list compiles our very favorites from all seasons!! Crimson – Winter annual. Very versatile and our most popular cover crop. Leguminous, meaning it fixes nitrogen to soil and decreases need for fertilizer for next crop. Plant in Oct-Dec for large amount of fall biomass that will outcompete weeds and reduce erosion. Ladino (White) – perennial legume. Persistent. Flowers for a long season and attracts pollinators. Very great pasture and lawn legume, grows well when over-seeded in lawns. Great forage material. Yellow Blossom Sweet “Bee Clover” – Biennial. Winter hardy. Drought resistant. Sow in early spring or fall for attracting honey bees. Pasture, hay, and organic green manure. Grows 4 to 5 feet tall. Must be inoculated for best performance. Tillage Radish – Daikon-type radishes break up heavy clay soil with their large and penetrating root system. Increases soil aeration and water infiltration. Decreases compaction and increases rooting depth opportunities for successive crops. Taproot absorbs important residual macro- and micro-nutrients from the soil and holds them until termination in the spring. Does not do well in poorly-drained soils. Annual Ryegrass – turf grass with dense, shallow root system. Erosion control. Absorbs excess soil nitrogen. Rapid, dense growth crowds out weeds. Grows in winter and spring but dies out in summer heat. 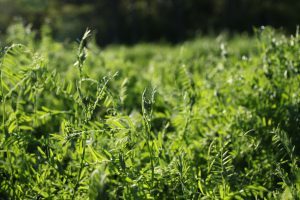 Hairy Vetch – Fixes nitrogen into soil. Improves soil tilth and texture. Provides weed control when it grows vigorously in spring. Increases disease resistance in crop that follows it. Can be toxic to horses if they overeat in pasture. Seeds are toxic to chickens. We advise not growing vetch around livestock. Austrian Winter Peas – Not edible. Cold-hardy overwintering pea is an excellent choice for cooler, poorly drained soils that may not be conducive to other legumes. Fixes nitrogen. Sow in the fall or as soon as possible in the spring. Turn over in mid-late spring. Buckwheat – Self-seeding annual. Quick growing. Drought resistant. Wonderful source of nectar for bees and other pollinators. Frost-killed. Cowpeas (aka field peas, Crowder peas, or southern peas) – Edible annual. Staple in traditional Southern cuisine. Loves hot weather. Thrives in drought and poor soil. 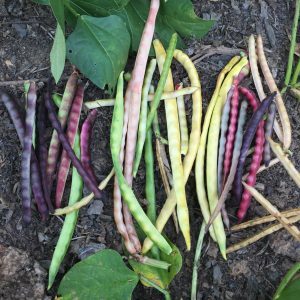 Legume adds nitrogen to the soil and is the best summertime nitrogen-fixer.